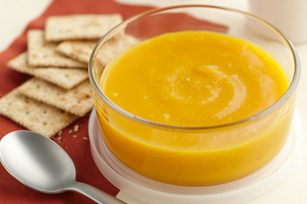 This homemade butternut squash soup has a touch of citrus and ginger to add extra flavour. Made in less than an hour, our Butternut, Ginger & Orange Soup is sure to become a new fall favourite. Cook and stir onions, ginger and garlic in dressing in large saucepan 5 min. or until onions are crisp-tender, stirring occasionally. Add squash and broth. Bring to boil; cover. Simmer on medium-low heat 30 min. or until squash is tender. Blend, in batches, in blender until smooth. Serve with crackers. The squash in this soup is an excellent source of vitamin A.